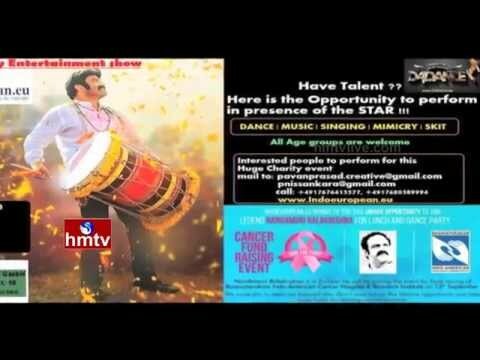 Legend Balakrishna In Europe Sep 13th. Here is the time to show our support to a great cause – fight against Cancer.Cancers account to 13% of all deaths each year and adequate medical treatment can reduce that loss to a great extent. Cancer treatment is one of the most expensive health care issues and in countries like India, many organizations and Hospitals are being part of helping people who can not afford such expensive treatment. BASAVATARAKAM INDO-AMERICAN CANCER HOSPITAL & RESEARCH INSTITUTE, Hyderabad, was established by Sri. N.T.Rama Rao (former Chief Minister of Andhra Pradesh), along with Indo American Cancer Organization (IACO) which includes several philanthropists, Scientists and Physicians. The hospital provides Cancer treatment to poor and needy, free of cost. Nandamuri Balakrishna, popular film personality and Chairman of the Hospital is on a mission to provide Cancer treatment to as many patients, who can not afford expensive treatment, as possible. Now he is here in Europe and it’s the time to extend our support to this great endeavor. ​Indoeuropen.eu i​s privileged to be a part of this mission and inviting you all to be part of it to make it a grand success. ​Meet the star, have lunch together, get entertained by many programs and contribute to the cause. As seats at the venue are limited, entry is with Advanced booking only. If you want to donate any bigger amount to Balakrishna garu at the venue, Please inform us about it so that we can make an arrangement for you. Please have a look at the video link and posters for more details. write to indoeuropean.eu@gmail.com for inquiries.